This week will be some old-school ads from the 50s and 60s. They really had some cool ads back then. 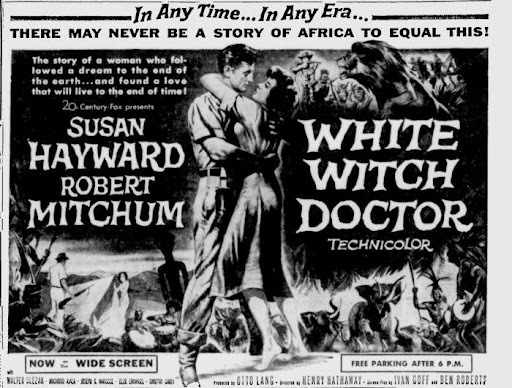 Here's an ad for White Witch Doctor from 1953. Susan Hayward is a nurse in Africa to bring the doctor she works with fresh medical supplies. She must hire Robert Mitchum, a fortune hunter, to carry her upriver. Along the way they battle gorillas, snakes and vicious natives. And of course, they fall in love.